This week my thoughts have been all about Halloween. I LOVE Halloween! I'm not sure what it is about it but I think Halloween is so much fun to decorate for and the kids just love it. 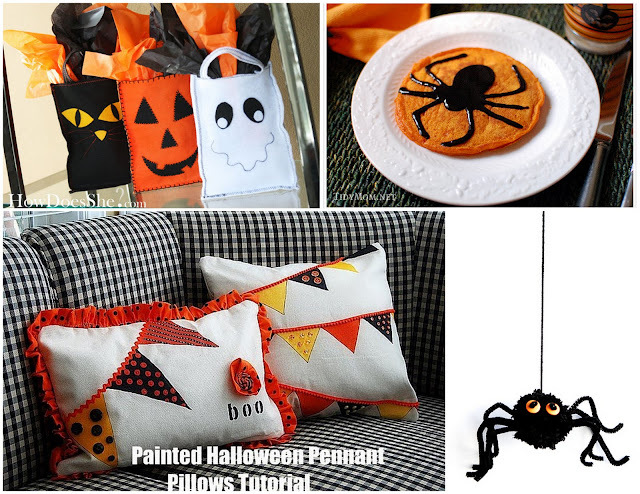 I guess I'm not the only one turning their thoughts to Halloween because Halloween projects are all over the blog world right now. First off, eighteen25. They are hosting a "Spooktacular September" event where everyday they feature a new crafter with a Halloween related tutorial. So far it has been A.W.E.S.O.M.E! My jaw has dropped on a daily basis, and a lot of the crafts are super easy and stuff you could get your kids involved with. Be sure to check them out. Here is just a sample of the goodies you'll find over there. Then when I came across this candelabra by Saw Dust and Paper Scraps who was guest posting at Tatertots and Jello and I literally couldn't believe it. She MADE it. I'm not kidding. She MADE it! I know, unbelievable. You'll have to check it out to see what she did, but her total cost was around $26. Really, too cute for words! Now onto a great, none Halloween, idea. The clever lady at The Bird's Papaya made this adorable book sling for her daughters room. Isn't that the best idea ever?!? It would be so easy to make and would keep all your kids books in easy reach, easy to put away, and visible to encourage reading. My kids are SO getting some of these! Now, I have a confession to make... 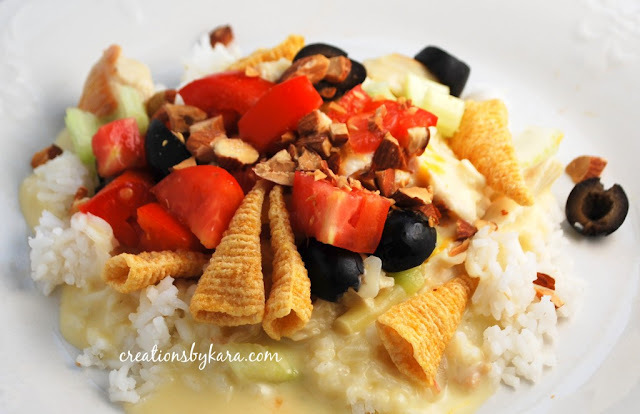 I have never made Hawaiian Haystacks. I have had them a church events, and once at my In-law's, and I loved them...but I've never made them. Well that is soon to change thanks to Creations by Kara. Don't they look so yummy!? Her recipe is actually made from scratch, rather then canned soup base, to make it a healthier (and tastier) option. YUM! And last, but not least, here is a tutorial for homemade sushi, brought to you by my awesome cousin at Create-A-Torium Crafts. They turned out so good too! I would never have been brave enough to try sushi at home but she makes it sound rather easy. How fun (and impressive) would it be to have a few friends over for a dinner party and serve them this?!? Or just get all the ingredients ready and let everyone experiment with and make their own roll. Too much fun! Great idea Jessica! Aren't all these projects great? I'm always amazed at the creativity and sheer genius that is floating around the blog world. I'm going to work on creating a "Featured" button, so if I have featured one of your projects you can come back in a few days to collect a button for your blog. EDIT: You can now find a featured button on my sidebar.